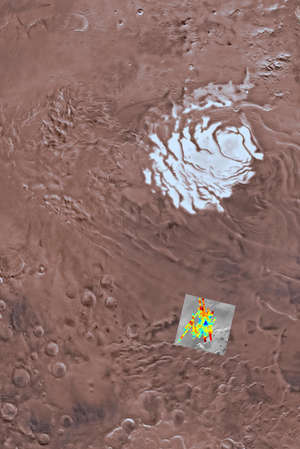 New radar observations show a potentially massive source of liquid water below the southern ice cap of Mars. New radar observations from a spacecraft orbiting Mars suggest water deposits lurking under the planet's south pole. But whether it's water, sediments infused with water, or something else altogether will require more observations, researchers caution. Researchers uncovered a strange signal using a low-frequency radar on the Mars Express spacecraft, called MARSIS (Mars Advanced Radar for Subsurface and Ionosphere Sounding). Observations between May 2012 and December 2015 showed "anomalously bright subsurface reflections" within the Planum Australe region, they report in a new paper in the journal Science. The possible water signal is buried 1.5 kilometers (0.93 miles) below the surface, in an area about 20 km (12.5 miles) wide. After analyzing the MARSIS radar signals, the study team said the bright feature has something called "high dielectric permittivity, matching that of water-bearing materials." Dielectric permittivity is a measurement of how much electrical polarization a material has when probed by an external electric field, such as the one used with ground-penetrating radar. "We based our discovery on the fact that rocks or soil with or without water have different electric properties — that's what the main issue is of this technology," co-author Elena Pettinelli told Seeker. Pettinelli is a researcher at Roma Tre University in Rome who specializes in probing under the subsurface of Earth and other planets. Pettinelli said a dielectric permittivity measurement between 20 and 22 is typical of wet sediments on Earth. The widely varying measurements on Mars suggest a reading above 15. Researchers said while the temperature near the poles would freeze pure water, that zone could contain dissolved magnesium, sodium, and calcium salts that would make a brine and allow the water to remain liquid. 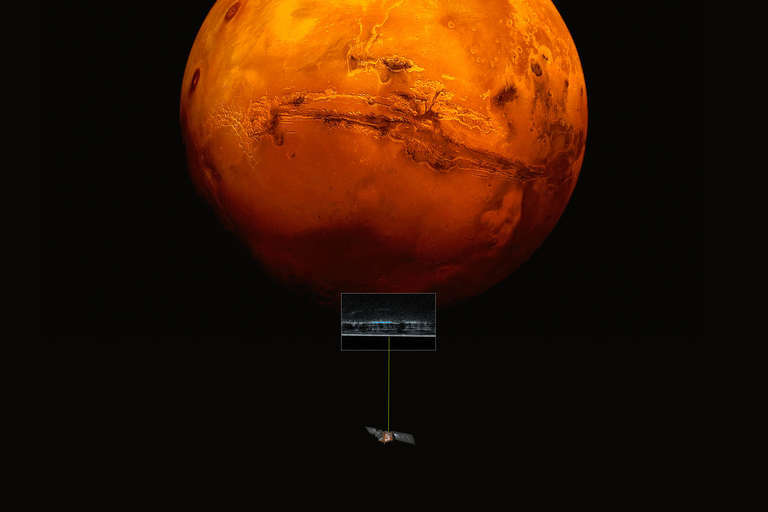 Mars Express has been orbiting the Red Planet since 2003. Pettinelli said an anomalous signature was first detected in Planum Australe as far back as 2008, but radar were inconsistent. Up until 2010 or 2011, Pettinelli said, scientists weren't sure if the signal was due to a problem with the radar or something under the ice. So engineers sent a software update to MARSIS to better optimize it for observations of those subsurface reflections around the south pole. New radar collections starting in 2012 showed a much stronger signal, Pettinelli said. Pettinelli cautioned that researchers hesitate to call the signal an underground "lake," but at the same time they are confident there is water in the sediments because they considered and discarded other hypotheses. For example, they considered that there could be a carbon dioxide or water ice layer within the zone that could affect the reflections, but this was rejected "because of the very specific and unlikely physical conditions required, or because they do not cause sufficiently strong basal reflections," the researchers wrote. The research was led by Roberto Orosei, a researcher with the National Institute of Astrophysics, in Rome. Another ground-penetrating radar is aboard NASA’s Mars Reconnaissance Orbiter, called SHARAD, which is short for “shallow radar.” SHARAD has been observing the subsurface of Mars since 2006. NASA's website says SHARAD is designed to see up to 4 km (2.5 miles) under the surface, which would include the zone where Mars Express detected signs of water. While Pettinelli said SHARAD's radar uses too high a radar frequency to see the signal, another researcher had a another take. Mars researcher Ali Bramson is a graduate associate at the Lunar and Planetary Laboratory in Tucson. In 2015, she led a Geophysical Research Letters paper that used SHARAD data to find an ice sheet in Arcadia Planitia in the northern hemisphere of Mars. Bramson said the Mars radar community remained curious about why SHARAD didn’t detect water below the south pole. She said the lower frequencies of the MARSIS radar are better for penetrating deeper into the ice and looking at the base of the icy deposits at the poles. However, SHARAD's signal should still be able to look at the same zone. In research published in 2011, SHARAD identified several spots in Planum Australe that have little or no reflectivity, which are called reflection-free zones. Coincidentally, one of these zones lies right over the new study area where the strange signal was found, Bramson said. But she cautioned that the signal was "very close to the limit of SHARAD's penetration depths." Bramson said better understanding of the water ice layers and sequestered carbon dioxide in the south polar cap of Mars, which affect radar signals, could help clarify what lies below the surface. While Bramson did not immediately interpret the signal as necessarily one of water, she said the potential would be interesting for life.